Andrea Dunlop has become one of my auto-buy authors, and in her latest novel She Regrets Nothing, Dunlop does not disappoint. The reader follows along as Laila Lawrence is reunited with the wealthy side of her family. And not just a little wealthy, these people know how to spend money and have a lot of it to spend. They quickly take Laila under their wing in NYC and begin to teach her what its like to be wealthy. 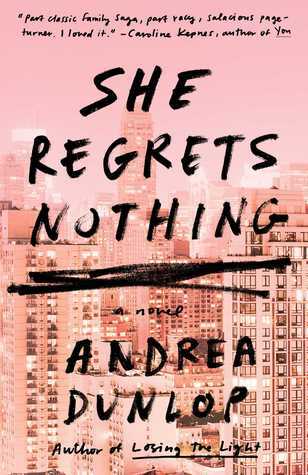 She Regrets Nothing is fast paced and extremely well written. Dunlop has a talent for keeping the reader on the edge of their seat, and I constantly felt the slight build up in her writing and knew that eventually something awful or amazing was going to happen. I loved the characters in this novel and felt that each of them were important to the plot and particularly complex. 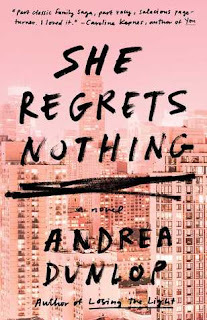 In summary, She Regrets Nothing is a gorgeous novel about deceit, greed, and what some will do for the love of money. I absolutely loved this novel and would highly recommend it! Thank you to Atria Books, NetGalley, Andrea Dunlop, and Booksparks for sending a novel in exchange for an honest review.